No dust mops needed here. The inside of a chip factory is cleaner than about any other place you can visit on Earth. 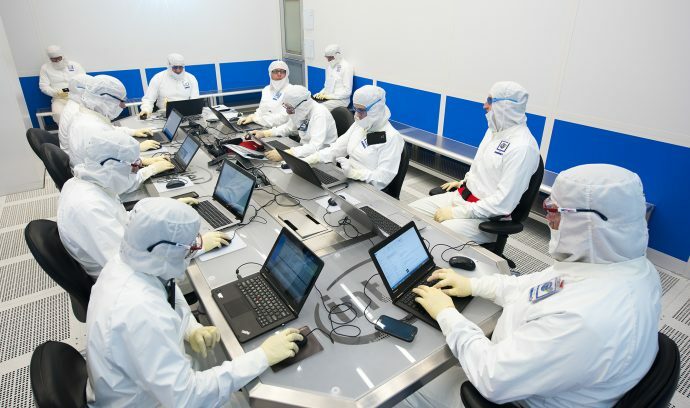 To avoid contaminating the chip-making process, the air in an Intel fab clean room is filtered to 1,000 times fewer airborne particles than a sterile hospital operating room. The “Team Room” inside Intel’s Fab D1X in Hillsboro, Oregon, is unique. It’s the sole conference room inside this entire multibillion-dollar factory. Though the fab sprawls over four football fields, every square foot is supremely expensive and valuable. That’s why Intel designed leading-edge Fab D1X with one and only room like this. Anything entering the fab – including the Fab D1X Team Room – must be thoroughly scrubbed or swabbed. Human skin and hair must be almost entirely covered. Workers wear head-to-toe bunny suits, protective glasses, two pairs of gloves, booties, hoods, and face masks. Workers often recognize one another by their build or their gait, not their face. In the D1X Team Room, anything that could shed particulates is verboten. No makeup, for example. Common supplies like paper and pencils are off-limits too – they both can create micro-dust. Only ink pens and special fab-approved synthetic paper are allowed in. This is the first photo inside the D1X Team Room ever shared externally.